West Cornwall is on the very tip of south west England like a foot jutting out into the Atlantic Ocean. Lands End situated on the very end of this beautiful peninsula is home to the first and last house and is a must place to visit. This extreme part of Cornwall has an air of wild ruggedness and its narrowness make it a quite unique place. There is nowhere else on mainland Britain where you can be only a few miles from both north and south coasts and if you stand on Trencrom Hill or Chapel Carn Brea you can see them both. There are many towns, fishing villages and harbours, coves and sandy beaches all with their own beauty and character. Penzance is the areas main historic market town, Falmouth is one of the biggest towns and Newquay is one of the most popular resorts. The peninsular with its many places of historic interest there is always something for everyone so you will never be disappointed with this charming part of England. Lizard Peninsula with its dramatic coast line and spectacular views juts out into the English Channel. The peninsula is a fantastic place to visit with its beautiful countryside and rivers, quaint fishing villages and golden sandy beaches, nature reserves and attractions. There is also excellent walking on the South West Coast Path. Lizard is a spacious village on the Lizard Peninsula with cafes and gift shops surrounding its large village green which is also used as a parking area. It is Britain’s most southerly village and the Top House pub is the most southerly pub. Half a mile to the south of the village is Lizard Point which is the most southerly point on mainland Britain and it is from near here the Spanish Armada was first spotted in 1588. This was one of the greatest invasion fleets in history and consisted of 120 ships armed with over 1,000 cannon and 29,000 men on board. Lizard Point is a notorious shipping hazard and for many ships the starting point of their ocean passage. To the east of the point is Lizard Lighthouse which has twin towers. It was erected in 1752 and is the oldest mainland lighthouse in Cornwall. Kaynance Cove, meaning ravine cove, and the surrounding coast are owned by the National Trust and have been popular since Victorian times. The cove with its wonderful turquoise water, white sand, islands and caves has been described as the one of the most beautiful stretches of coastline in the South West making it the most painted and photographed cove in Cornwall. The distinctive green and red serpentine rock formations of Kynance and other beaches and coves on the Lizard Peninsula have been polished by the sea over thousands of years. Kynance was once remote and very difficult to get to until the National Trust built a new toll road to a large car park on the Downs above the cove. When Kynance Cafe first opened in 1929 it relied on spring water and a generator for power. Once the cafe became the property of the National Trust in 1999 it was renovated and electricity and mains water were installed. 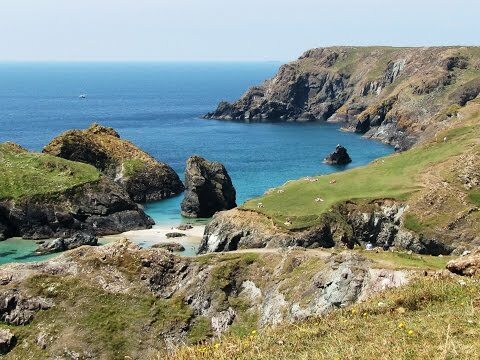 The Lizard National Nature Reserve is situated on Lizard Downs which is an open access area of moorland above the Kynance Cove. The reserve is a complex of numerous isolated sites and has two main habitats types which are the coastal grasslands and heaths and the inland heaths. There are a few nature reserves on the Lizard Peninsula attracting a lot of wildlife and the wildflowers are amazing, these sites are managed by The Cornwall Wildlife Trust and the National Trust. Cadgwith is a very quaint old fashioned fishing village with thatched cottages built from local serpentine. It is only a small village and harbour but houses a pub, a restaurant, a shop, a couple of cafes come gallery and gift shop, and a place where you can buy wet fish. The small shingle beach is still the centre of the village with a small fleet of crabbing boats winched up in front of the boat houses. Above the beach is an outcrop called The Todden a great place to sit on the benches and take in the wonderful view or to have a picnic. A little further south along the coast path is the Devil’s Frying Pan, a 200 foot deep hole in the cliffs formed many years ago when a cave collapsed. If you park in Lizard village it is a 10 minute walk to Lizard Point. From the car park at Lizard Point we take the South West Coast Path westwards and follow the path along the cliff tops to Kynance Cove. From here we take the path uphill at a blue signpost “High Tide Route to Cafe”. At the cross roads of paths we walk uphill on the gravel track and at the top we head straight forward on the wide track following the blue arrow onto Lizard Downs. We pass the car park on our right and keep heading forwards on the track still following the blue arrows towards the houses in the distance. We go through a gate to the left of the houses which leads us to the main road with a garage on the left. We cross straight over the road and take the bridleway and keep heading forwards to a minor road. We turn right and follow the road and at the t-junction we turn left and keep following the road. At the angled crossroads we take the second exit on the right between two posts and sign posted Cadgwith ¾ of a mile and car park 300 yards. We continue on the narrow road all the way to Cadgwith and downhill to its harbour. We walk to the end of The Todden then through the village and up to the lookout hut on the other side of the cove before returning back through the village and up the road we came in on. Just before the car park we turn left at the sign post Coastal Path Lizard Point 3¾. We now continue on the coastal path passing the Devil’s Frying Pan, Lizard Lifeboat Station, Bass Point Lookout Station and Housel Bay Hotel. When we arrive at a gate and tarmac road (if you turn right the road takes you to Lizard village) but we take the coast path over the road opposite to Lizard Lighthouse. We then head downhill back to the car park at Lizard Point. This is a moderate walk on good footpaths and tracks with some inclines and declines. There is also some minor road walking between Lizard Downs and Cadgwith. Elevation: Approx lowest point 8.7m (28.5ft) Approx highest point 78.8m (257.9ft). Approx 8.4 miles allow 3½ hours using OS map 103 The Lizard, Falmouth and Helston. Start Point: Car park at Lizard Point. Lizard Point on The Lizard Peninsular in west Cornwall. From the M5 take junction 31 onto the A30 bypass Launceston and Bodmin. Then take the A39 to Truro and carry on towards Falmouth. Before Falmouth take the A394 to Helston. At the second roundabout take the A3083 and follow the road to Lizard village or continue down the narrow road to Lizard Point. There is ample car parking on the green in Lizard village and limited parking at Lizard Point accessed by a narrow single road with only a few passing places. There is also a car park at Cadgwith. There are public toilets in Lizard village, Lizard Point, Kynance Cove and Cadgwith. For refreshments there is a selection of pubs and shops in Lizard village and a cafe and shop at Lizard Point. There is also a cafe at Kynance Cove and in Cadgwith there is a shop, wet fish shop, restaurant and a pub.